The Beatles Survivor #11 Winner: WHILE MY GUITAR GENTLY WEEPS!!! The Smiley Smile Message Board | Non Smiley Smile Stuff | General Music Discussion | The Beatles Survivor #11 Winner: WHILE MY GUITAR GENTLY WEEPS!!! We are going to split the album in two, so round #11 is Disc 1 and round #12 will be Disc 2. 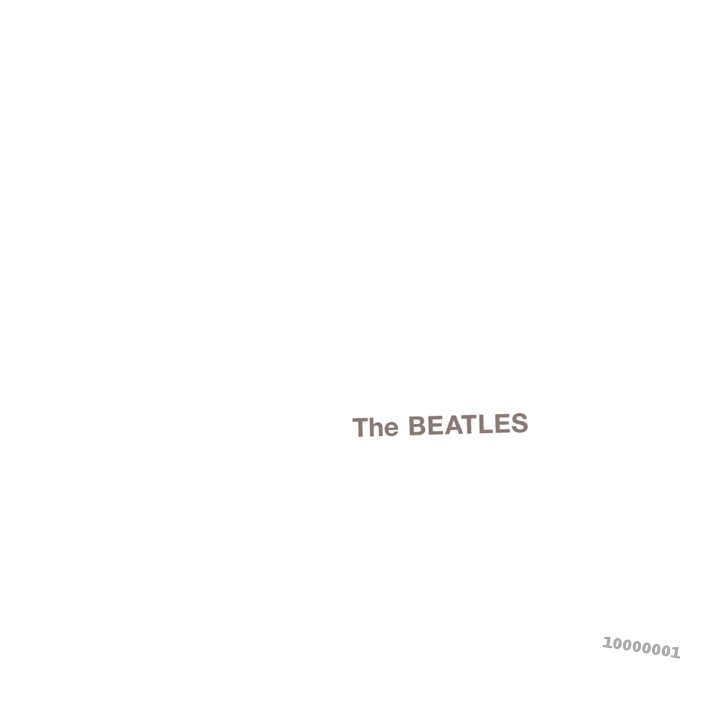 The Beatles, also known as the White Album, is the ninth studio album by English rock group the Beatles, released on 22 November 1968. A double album, its plain white sleeve has no graphics or text other than the band's name embossed,[a] which was intended as a direct contrast to the vivid cover artwork of the band's earlier Sgt. Pepper's Lonely Hearts Club Band. Although no singles were issued from The Beatles in Britain and the United States, the songs "Hey Jude" and "Revolution" originated from the same recording sessions and were issued on a single in August 1968. The album's songs range in style from British blues and ska to tracks influenced by Chuck Berry and by Karlheinz Stockhausen. On release, The Beatles received favourable reviews from the majority of music critics, but other commentators found its satirical songs unimportant and apolitical amid the turbulent political and social climate of 1968. The band and Martin have since debated whether the group should have released a single album instead. Nonetheless, The Beatles reached number one on the charts in both the United Kingdom and the United States and has since been viewed by some critics as one of the greatest albums of all time. Welcome to a new round. We are entering the final stretch of the Beatles main catalog. Please remember to vote off which of the tracks is your LEAST FAVORITE TRACK!!! There are a ton of tracks on this one! First round is an easy pick for me. This song comes across more as a pastiche than an actual song. Despite the title's possible tie-in to the Beach Boys, my vote is Wild Honey Pie. Vote! VOTE! V O T E ! ! ! ! ! Hmm, can't decide between Wild Honey Pie and Don't Pass Me By. I like both, but I don't love them. At least Wild Honey Pie doesn't overstay it's welcome...at 3:50 Don't Pass Me By is the 3rd longest song on disc 1. I kind of like the Anthology version which is shorter, stripped-down, and Ringo talks over the fade. I don't like the sped up mono version. Well, I'll reluctantly choose Don't Pass Me By. I'm a big fan of Good Night. Even if the Beatles had released the White Album as a single LP, I think Good Night should have closed it. I think it's a perfect way to end the album and give Ringo a lead vocal. Perhaps if John and George were more involved, Don't Pass Me By would have turned out a little better? Easy first round. Wild Honey Pie, easily IMO the best argument on disc one for The White Album being a single album. There are several certified clunkers in this bunch. Wild Honey Pie has got to go. Wild Honey is a great song. Wild Honey Pie is not a great one, so my vote goes against that. I'll concur with Wild Honey Pie, I guess. I would've definitely done the whole album instead of 2 parts. My first choice regardless of how it was done would be Wild Honey Pie. Only 8 smilers playing? Where is everyone? Luckily I won't have time to tally and post until tonight. I think maybe there are too many ambiguous tracks on this album for some people to vote. Some songs - like, say, Rocky Raccoon - I can't decide if it's a good song or a bad song. I mean, I kinda like it in a goofy sort of way, but I also recognize that's it's not like some sort of major work of art. So do I vote for it sooner, or later? Probably half the songs on the list are like that, at least to me. Wild Honey Pie also for me. It's sort of interesting, but it barely even feels like a real song. It's just so....weird, which isn't unusual for The Beatles, but it's also not very good, which is unusual for them. But you aren't supposed to vote off which is a "BAD" song. You vote off which one you enjoy the least. You can't think of it as if you were declaring your everlasting hate for a song when you vote off. It's a game. Have fun. 9 smilers voted for 2 songs. Wild Honey Pie was thrown up and out. Glass Onion or Don't Pass Me By? I think I am more charmed by Don't Pass Me By, so Glass Onion it is. (I think John would agree). I'm also going with Piggies. Mmm. Tough choice. Ringo's song is nice, but it always seemed like a low point on the album to me. Just a pleasant country song, but nothing that great. Then again, as much as I like certain parts of Piggies (the harpsichord is lovely), it's one of the songs I listen to the least on the album as well, and given how strong George's other songs are, it always seemed like a disappointment. Just too lightweight. 9 smilers voted for 5 songs. I spied 4 smilers clutching forks and knives to eat their bacon! Glass Onion or Don't Pass Me By? I think I am more charmed by Don't Pass Me By, so Glass Onion it is. (I think John would agree). Second round in a row. Powered by SMF 1.1.21 | SMF © 2015, Simple Machines Page created in 0.298 seconds with 21 queries.